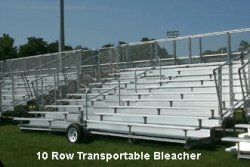 Add spectator seating in a flash with a transportable bleacher set from BuiltRiteBleachers.com. Share one bleacher set with multiple sports fields. 10 Row - 24'L -Transportable w/Single Footplank- Seats 160 - Weight 3847lbs. 10 row x 24' non-elev trans bleacher- Net seating capacity 160-Galvanized steel understructure-(with transport wheel brackets and additional transport bracing)-2 X 10 anodized aluminum seat plank-Single 2 x 10 mill finish aluminum foot plank rows 2-3-Double mill finish aluminum foot plank rows 4-10-1 x 6 riser rows 4-9, (2) 1 x 6 top row risers-2 X 6 Treated lumber groundsills-Chainlink guardrail system. Important Note: The BRB-TKHDS 10 Row Wheel Kit (Hydraulic) is required to make these bleachers operational, one kit can be shared among many 10 row transportable systems. Be sure to add one with your quote/order, see "Frequently Bought Together" below.